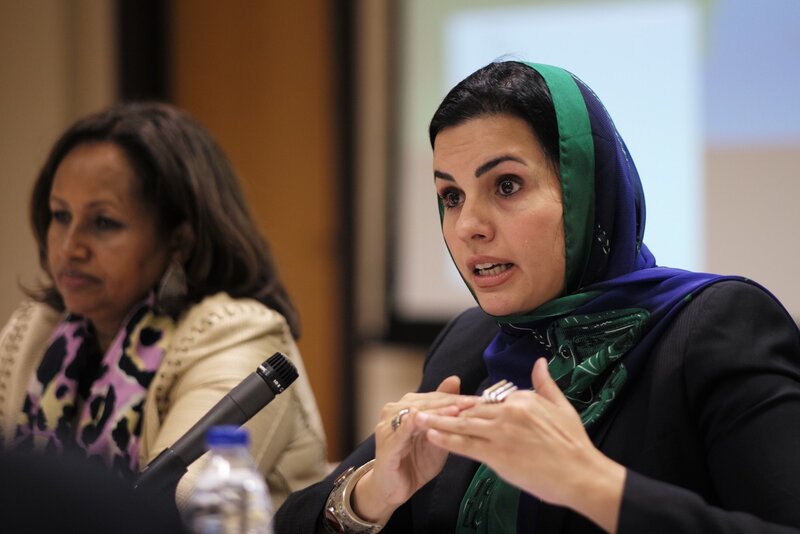 Women leaders from across the Arab region used the launch of the Arab Human Development Report in Beirut to highlight the importance of the women, peace and security agenda. 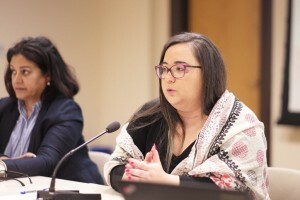 A panel of experts told the launch that the region will not be able to build peace and achieve global development goals if it continues to exclude and marginalise women in political and diplomatic processes. Published by the UNDP yesterday, the Arab Human Development Report paints a startling picture of a region experiencing unprecedented levels of conflict. Despite being home to just five percent of the world’s population, nearly half of all terror attacks target people in the region. The Arab world hosts almost half of the world’s internally displaced, well over half of the world’s refugees and nearly 7 out of 10 of the world’s battle deaths in 2014 occurred there. 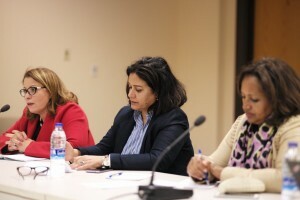 From left to right, Saadia Wadah (Morocco), Jamila Ali Rajaa (Yemen) and Hibaaq Osman (Somalia) attended the discussion. In perhaps its most worrying section, the report suggests that if current trends continue, in 30 years three quarters of the region’s entire population could be living in a country affected by conflict. The report notes that the level of conflict and instability in the region is having a disproportionate impact on women and girls. Wars and political instability can lead to the increase of early marriage, gender-based violence, and the marginalisation of women in public life. While the UN and its member states are committed to addressing such issues through the Women, Peace and Security agenda, implementation remains a problem – with only two Arab states having published National Action Plans stating how they will implement the agenda. The panel discussion brought together expertise and insight from leading activists and professionals from Lebanon, Libya, Morocco, Somalia and Yemen. The session also heard from young women from Egypt, Iraq, Syria and Tunisia, who were able to talk about how their lives had been affected by the 2011 revolutions. Zahra’ Langhi of the LWPP talks about the breakdown of security in Libya. Ghida Anani of ABAAD discussed the institutional inequality faced by women in the region. “Women and Girls suffer today more than ever from the cost of war in the region. The number of women being affected by various forms of gender based violence, forced prostitution, child marriage, trafficking, domestic violence among other is highly visible. UNSCR 1325 and the women, peace and security agenda were meant to ensure the prevention of conflict, the protection of women, and women’s participation during time of conflict, however it is effectively invisible in gender-based violence programming during humanitarian crisis”. “While this report is significant in its findings, I’m afraid it does not reflect enough on the appalling circumstances many women it in the region face. The crisis in Yemen sees 21 million people are reliant on humanitarian aid, while the country’s health system has completely collapsed, affecting women disproportionately. At the same time women and women’s needs are simply not part of the peace process.